That’s because the fact of the matter is that I haven’t had newly available pieces to publish and show since Cherie’ De Villiers 2016 Summer exhibition last year. Not because I’ve been lazy but because I’ve been very busy on bespoke commissioned work since then. Here at last is the first piece I’ve been able to make generally available on consignment in the last four months. What I like about this piece is the more detail than usual and the surface quality. Thats something that seems to have happened in my work recently … somehow the game upped a tad in respect of content detail and surface quality. The better surface quality has to do with more attention paid to canvas prep and the more detail I guess is the outcome of experimentation and process of growth. I’ve discovered something important after travelling some hard yards in years gone by … You have to grow as an artist … the day you stop growing as an artist is the day you start shrinking as an artist. Herewith my latest piece available at Cherie’ De Villiers gallery. Title:- “Over The Hill And Far Away”. If this piece interests you let me know asap. 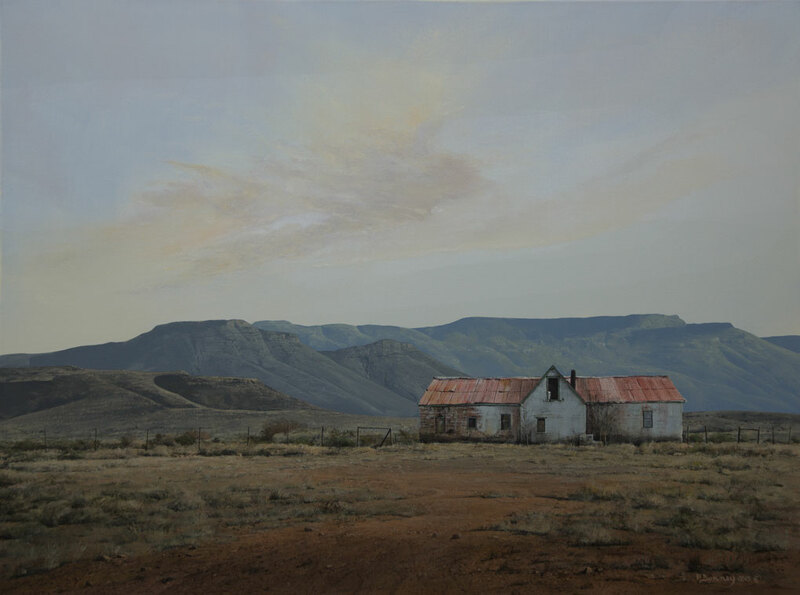 Chérie De Villiers Gallery Summer Exhibition is on in Hyde Park Corner as we speak and running till 11th September. So sorry. For quite some time now there haven’t been any new consignment pieces available . This is because I have been hard at work on some bespoke commissions. These are by and large out of the way and delivered now … so … (at last!) … here are two new pieces landing at Cherié De Villiers gallery as of tomorrow (24/06/2016) … on consignment at the gallery and available now. Get there and see it live! 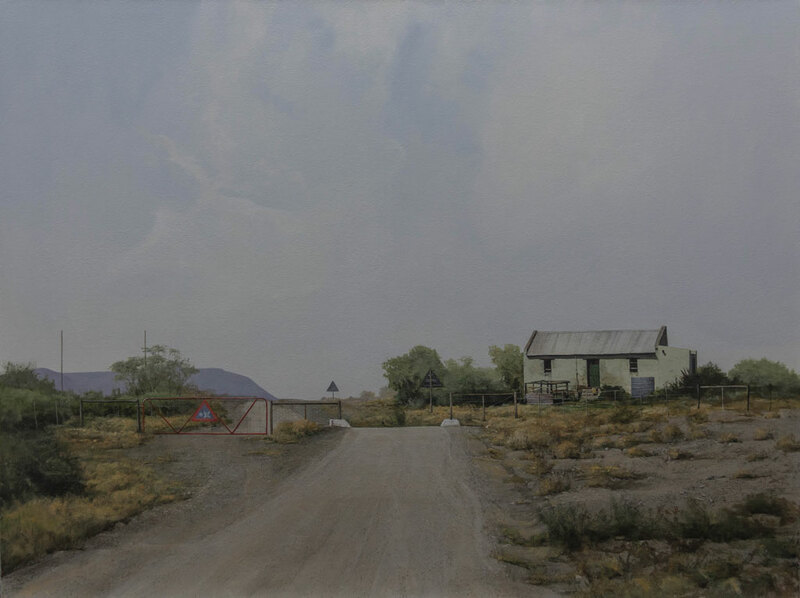 My quest at the moment is to maintain my typically wide open, remote and empty feel but at the same time to get more content and detail into my paintings without losing the very important ‘natural’ feel that is so crucial to portraying reality. … but is it a happy place … and is he a happy old man … I wonder? I’ve lost count of how many times I’ve stopped my car and found myself immersed in this kind of scene and thought to myself … Wouldn’t it be great to live this far from the madding crowd, with the kind of lifestyle of this old man, in this kind of amazing spot, soaking up the setting sun in the foothills of the Langeberg mountain range. Then I have to stop … and think again … and count my many blessings. The reality is the old man’s probably looking at me and thinking in his own inimitable way … “Wouldn’t it be great to have a fancy camera like that … and a zooty little car so I could drive off to Cape Town and visit my children … and eish … those Nike’s!” He would probably dearly love to be in the very midst of the madding crowd, closer to family and friends – and running water – and a roof over his head that doesn’t leak, and other such luxuries … not to mention bare necessities and basics. Think again Petebon. Anyway … as for me, it’s back to late light on the Langeberg again. Despite everything I just can’t get the Langeberg and Riviersonderend mountains out of my system these days I’m afraid … especially around the Robertson region. 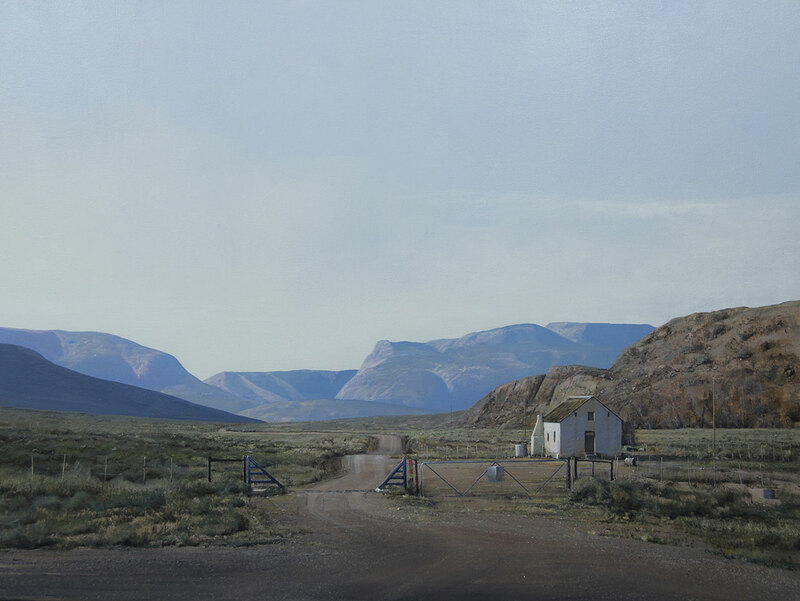 Mountains aside … I love the color in this painting. The green window shutter and yellow doors … especially the one on the right, and the orange trim on the cottage, and the bit of dirty red on the truck grill, all just do it for me. Since the “Caledon Canola” painting I’ve been getting a bit braver and bolder with colour, especially green, and really been enjoying breaking out of the typical Bonney grey / brown mold for a bit. Change is as good as a holiday they say. I don’t often put people in my paintings but this old man was sitting on his stoep looking like he really belonged there. I absolutely couldn’t leave him out, and he gave me some food for thought … and got me counting my blessings. This was my first ever experience of the Overberg Caledon region in winter when the canolas flower. All I can say is “O WOW … AND … O WOW AGAIN!” … What an absolute over the top amazing experience. 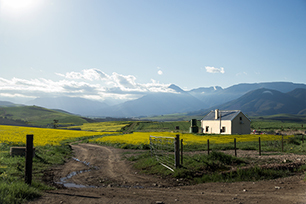 I know well the vivid greens of the Western Cape winelands, but the vibrant yellows of the rolling fields of newly opened canola flowers in the Overberg in winter adds a whole new dimension to vivid green. It’s visual sensory overload of absolute note … you have to see it to believe it! Pretty much impossible to capture the reality on camera or on canvas. 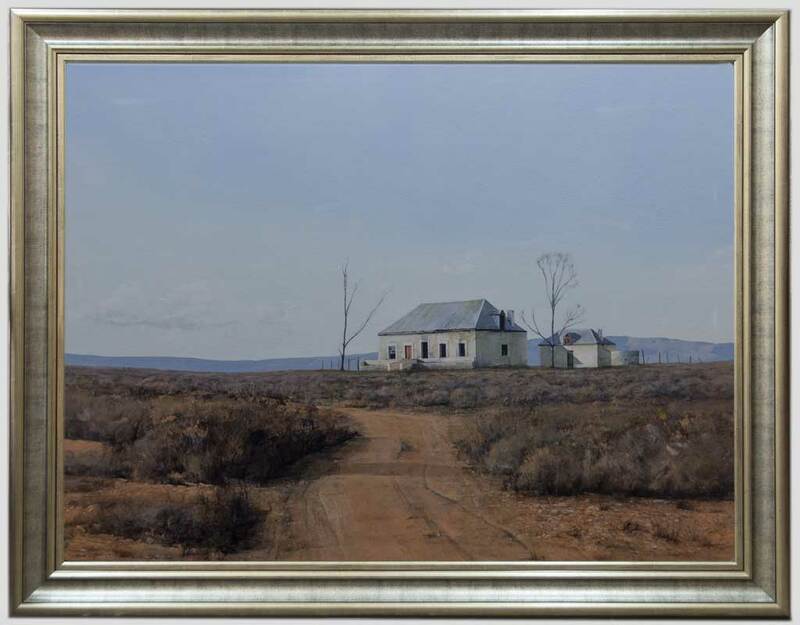 For me; from the familiar and safe muted grays, blues and beiges of the remote Karoo to the not so familiar vibrant greens and yellows of the Overberg in winter was challenge of note … but hey! … what would life be without challenge and doing something completely different and out of the box … BORING I guess! I’ve driven past this old house in Leeugamka who knows how many times in the last who know how many years and have taken who knows how many photos of it over those years. I’ve done who knows how many paintings incorporating this very same house from various different angles and viewpoints and in different seasons of the year and migrated it into who knows how many different settings and this is the most recent. I just love this decaying monument to a rich past and have documented on disk and in many paintings its fall from grace … quite sadly! 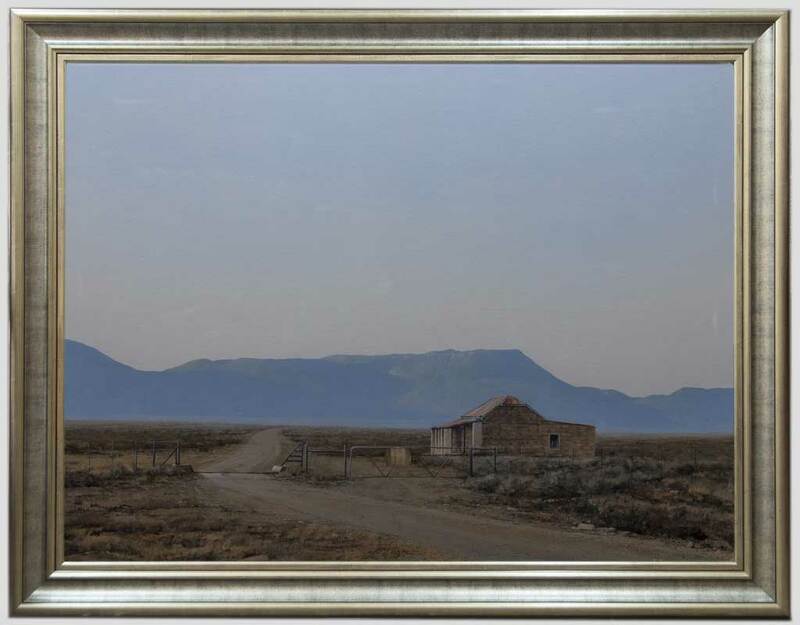 The title of this painting is “In The Shadow Of The Nuweveld” … even though its not really in the shadow of the Nuweveld. Its just nearby though … only about 80 Km or so away in fact. 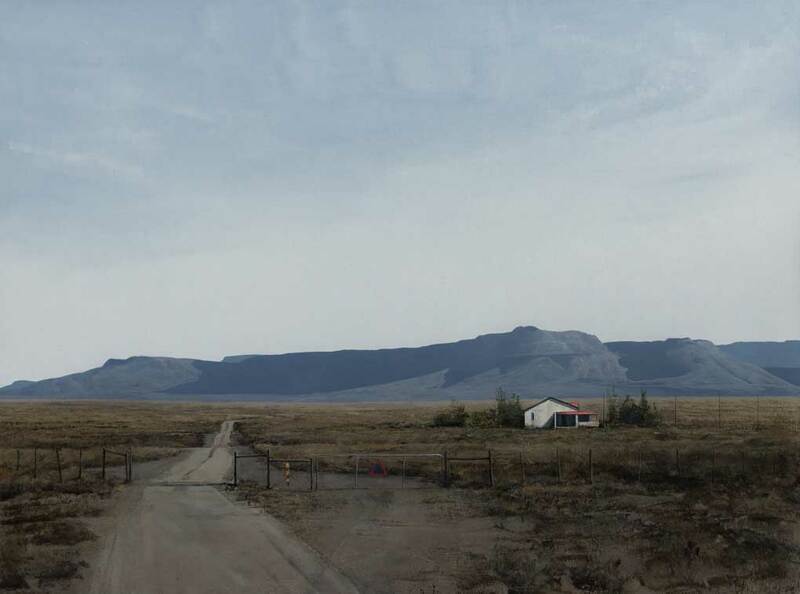 The backdrop is the Nuweveld mountain range around Beaufort West and the house is transposed from Leeugamka to there by … eurm … moi! Call it artistic license if you will … or con artist if you won’t!… whatever! I’m not a camera … I’m a painter. And Then This … The Daft Thing I Did Down In Capetown Last Month With My Daft Son In Law Jonathan Blackwell In Celebration Of His Fortieth Birthday. Just got back from a really great month of travel through the central Karoo down to Cape Town … a week in Capetown catching up with children, grand children and grand dogs and then a superb drive over four days via the Southern Cape Overberg, Caledon, Calitzdorp and Colesburg back to Clarens. 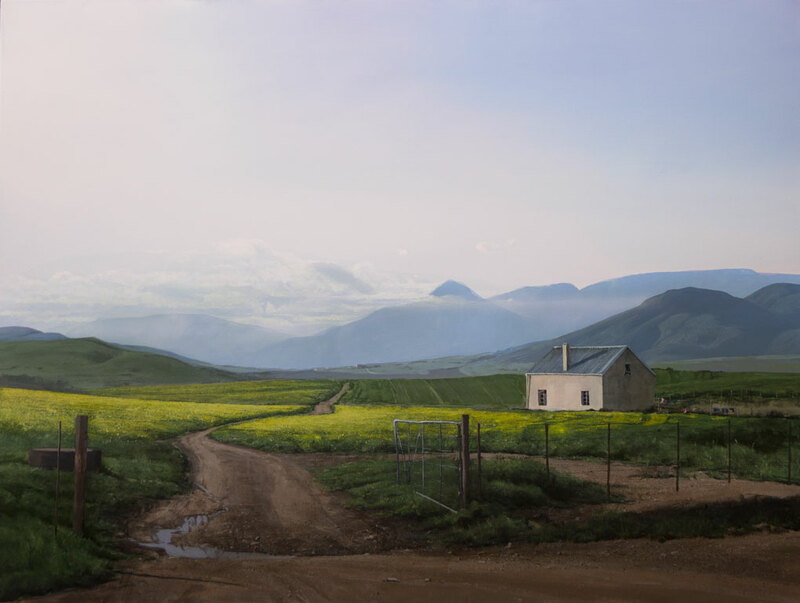 The primary mission on that route back was to collect photo reference of canola fields around Caledon for a bespoke commission work of the Overberg landscape incorporating Canola fields. Timing was good … the flowers were in the process of blooming and weather was perfect. Out of a zillion photos shot in two days I’ve come up with this composite concept for the painting and can’t wait to get back in studio and get on with it. I’m thinking this is going to be some serious challenge though, being very unfamiliar yellows and greens as opposed to my normal and customary palette of muted greys and blues. Anyway … a change is as good as a holiday they say so watch this space. 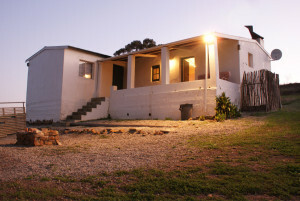 We overnighted in the cutest little cottage in Caledon … Piet My Vrou Cottage on Drayton farm just off the N2 about 8K out of Caledon on the on the Riversdal side. Thanks Rene-Louise for the headsup on where to find the best Canola fields in the neighborhood and thanks too for the waterblommetjies. 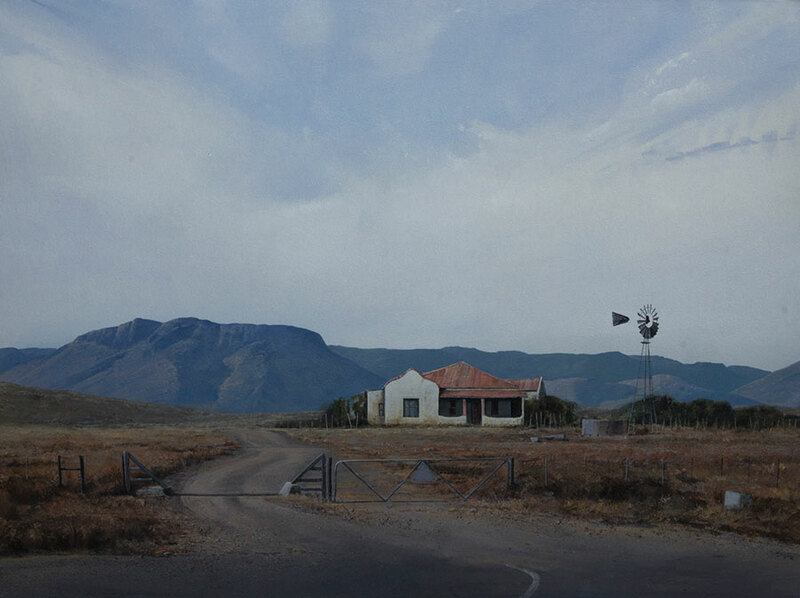 One of my shows at Crake gallery back in the late nineties was themed around Klaarstroom in the Eastern Cape. About fifteen paintings on the show and each one an aspect of that village. 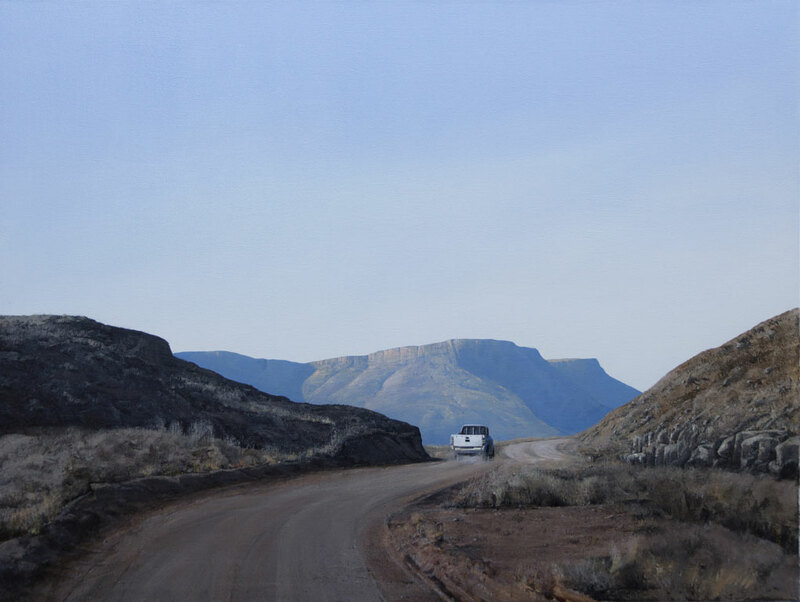 I fell in love with Klaarstroom way back then, and in particular the Swartberg Mountain backdrop behind Klaarstroom, especially the view on the approach from the Prince Albert side. 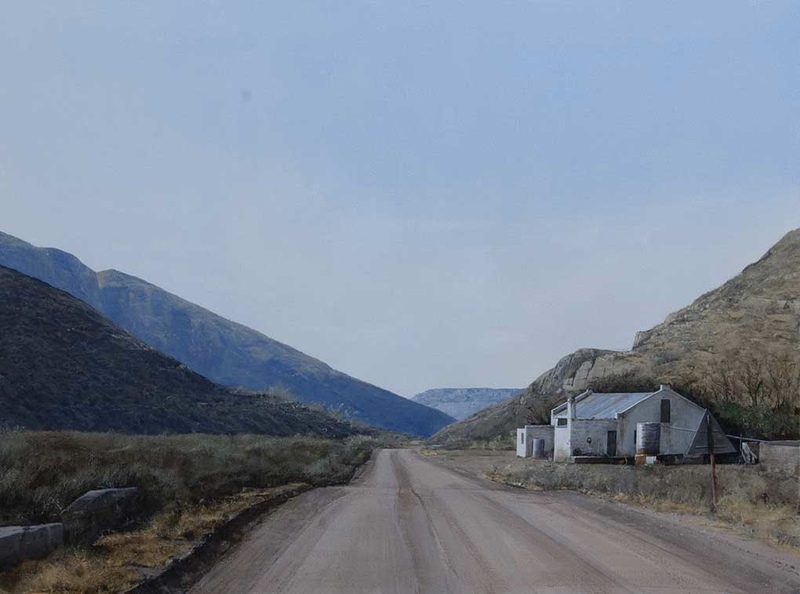 The background mountains in this painting is that view of those mountains. The saddle in the middle I’m guessing would be the Meringspoort gap. 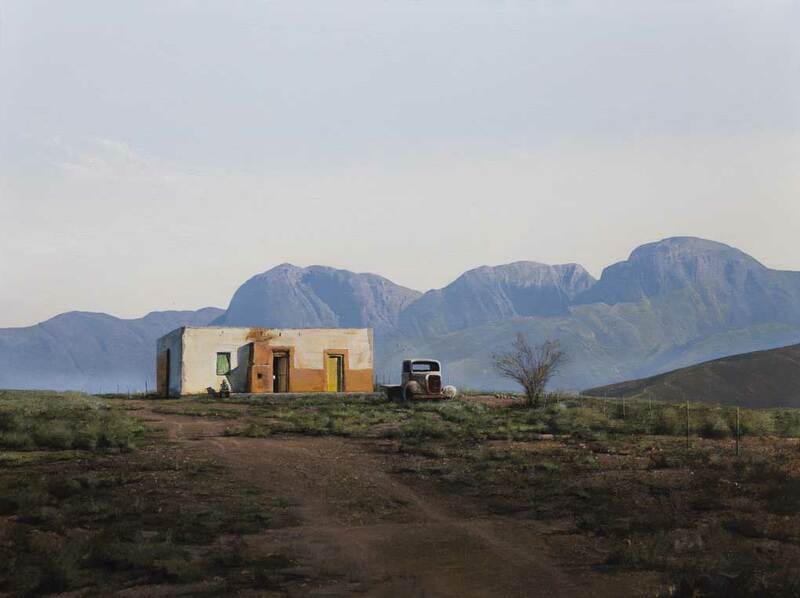 You can’t spend time in Oudshoorn without a drive to Klaarsrtroom via De Rust and Meiringspoort. 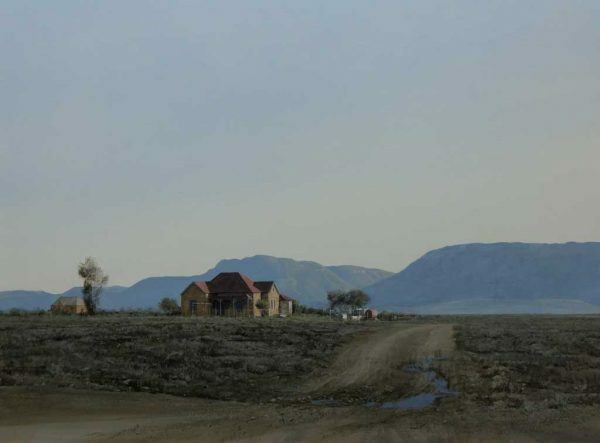 The Molteno Pass is on the R381 through the Nuweveld mountains on the road towards Loxton. Initially tar and then gravel taking you over the Molteno pass and on to Loxton 110km away. Built by engineer and adventurer Thomas Baines circa 1881 this is supposedly one of the oldest mountain passes in the country. If ever you happen to overnight in Beaufort West do yourself a favour … take the R318 Loxton turnoff from the N1, drive about 20 K’s then U turn and back to the N1. It must be during golden hour time of course … thats when the magic happens! Did you Notice my brand swanky new website? That’s why I’ve been off line and silent for a while. Been busy updating. Not because I really wanted to but because of the need to get mobile friendly. My old site was … well … old! … and tired! … and not at all mobile friendly … and yep … now it fits on your smart phone and you can actually read it there … try it sometime. I did like the artsy fartsy grungy look of the old one but am much happier now with the new cleaner slicker look. The downside of this update though, is that two long years worth of blog post archive has disappeared into the digital nether world … lost and gone forever never to be read again … but hey! … nothing like starting fresh from scratch I guess. Archive gone but life goes on! This is arguably one of the most scenic bits of road In the country (if you enjoy remote that is!). Take the NI from Beaufort West in the Three sisters direction. Drive about five K’s and turn left onto the R381 towards the Nuweveld mountains … over the incredible Molteno pass and on towards Loxton. Stunning … especially the Molteno pass … Supposedly one of the oldest in our country built by Thomas Bain around 1881! Another great drive is the R398 in the Eastern cape. Its a gravel road of a hundred and something K’s joining Middleberg and Richmond. It takes you through some pretty remote and lonely areas and is somewhat gnarly in places … but really beautiful … especially in ‘golden hour’ time.